Looking to buy a micro:bit? See the list of resellers. The red lights are LEDs (light emitting diodes) and form a 5 x 5 LED Screen. They can be set to on/off and the brightness can be controlled. The yellow light on the back of the micro:bit is the status LED. It flashes yellow when the system wants to tell the user that something has happened. Buttons A and B are a form of input. When you press a button, it completes an electrical circuit. The micro:bit can detect either of its two buttons being pressed/released and be programmed to act on these events. Button R on the back of the micro:bit is a system button. It has different uses. When you have downloaded and run your code onto your micro:bit, press Button R to restart and run your program from the beginning. When you plug in your micro:bit via USB, it should appear as a MICROBIT drive. If you accidentally hold down the reset button as you’re plugging in your micro:bit, the micro:bit will appear as a MAINTENANCE drive instead of MICROBIT. This is known as maintenance mode. To continue programming your micro:bit YOU MUST unplug your USB and reconnect it. Check that the drive now shows as MICROBIT. The compass can detect magnetic fields such as the Earth’s magnetic field. As the micro:bit has this compass, it is possible to detect the direction it is moving in. The micro:bit can detect where it is facing and movement in degrees. This data can be used by the micro:bit in a program or be sent to another device. There is an accelerometer on your micro:bit which detects changes in the micro:bit’s speed. It converts analogue information into digital form that can be used in micro:bit programs. Output is in milli-g. The device will also detect a small number of standard actions e.g. shake, tilt and free-fall. The pins can be a form of electrical input or output. There are labels for the input/output pins P0, P1, P2, which you can attach external sensors to such as thermometers or moisture detectors. The screen can also be used a light level sensor (it’s a really cool trick). Temperatrue is measured on the micro:bit by detecting how hot its physical CPU material is. Since it operates nearly as cool as the air around it, the temperature it measures for itself is a good approximation for the ambient temperature (the temperature near and around it). The micro:bit embodies many fundamental concepts in computer science. To learn more, read the micro:bit - a reactive system. How do I connect the micro:bit to my computer? Your micro:bit can be connected to your computer via a micro USB cable. Data can be sent and received between the micro:bit and the computer so programs can be downloaded from Windows, Macs and Chromebooks onto the micro:bit via this USB data connection. Click here to read more information on how to run scripts on your micro:bit, and click here to read more about the error messages you might get. When your micro:bit is connected to your computer with the micro USB, it doesn’t need another power source. When your micro:bit isn’t connected to your computer, tablet or mobile, you will need 2 x AAA 1.5 V batteries to power it. The pins labelled 3V and GND are the power supply pins. You can attach an external device such as a motor to these and power it using the battery or USB. The micro:bit can send and receive data via serial communication. The serial data can be transferred via USB or BLE. You will see the label BLE ANTENNA on the back of your micro:bit. It is for a messaging service, so that devices can talk to each other. The micro:bit is a peripheral device which can talk to a central device like a smart phone or tablet that has Bluetooth Low Energy (BLE). The micro:bit can send signals and receive signals from a central device so another BLE device can control the micro:bit or the micro:bit can control another BLE device. The micro:bit has been designed to be a bare-board micro controller for use by children aged 11-12. 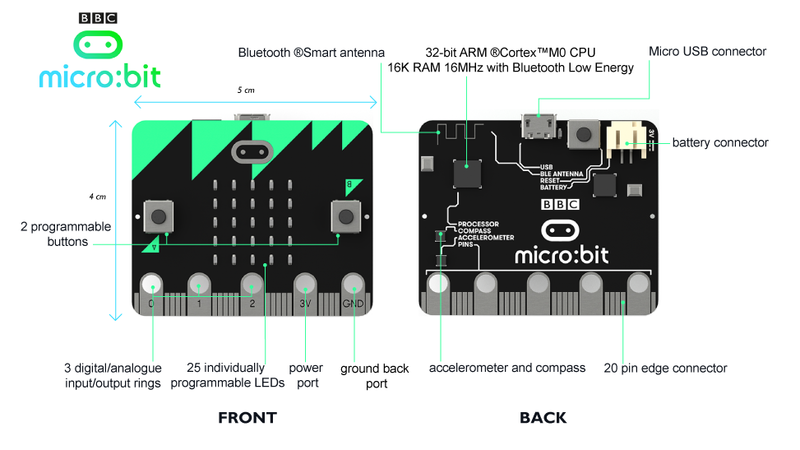 More information is available at the Microbit Foundation web site.